If you ever dream of the high life when playing the slots, then the Jet-Set slots will give your imagination even more to work with. Click here to play! Dreams of untold wealth are all a part of what makes playing slots so attractive, and reminders of what a massive jackpot could lead to are very encouraging when wondering whether to make a maximum bet. 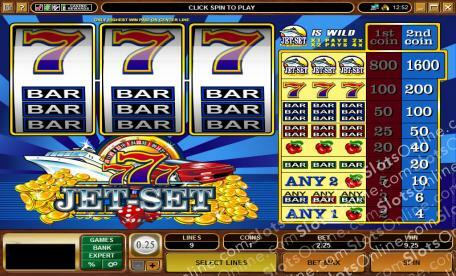 As a classic 3-reel slot machine, Jet-Set features symbols such as red cherries, BAR symbols, and lucky 7s. The jackpot and wild symbol is the Jet-Set Cruise Ship, though, and the slots also feature pictures of piles of gold and hot rods. By making a maximum bet of 2 coins, you are eligible to win the maximum jackpot of 1600 coins. It could be enough money for you to start living the Jet-Set lifestyle! Fly on over to an online casino to play the Jet-Set slots and start dreaming about the lavish holiday you could have if you win the jackpot. The Jet-Set Cruise Ship symbol is wild and can substitute for any other symbol. When 2 symbols substitute, the payout is doubled. When 3 symbols substitute, the payout is tripled.